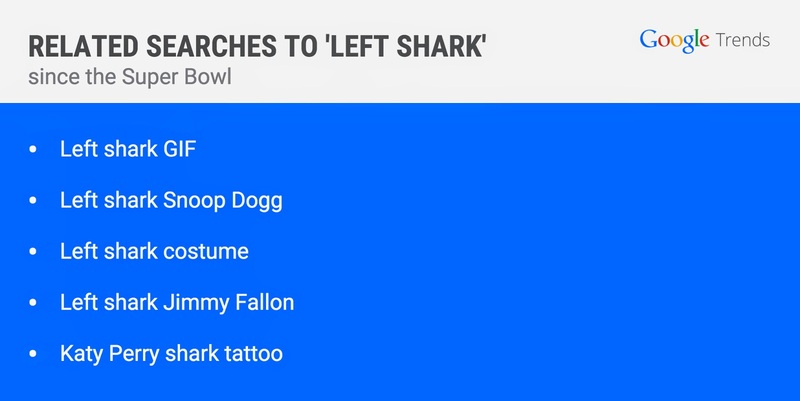 From a shark with two left feet to a sequel that has everyone buzzing, here’s what trended on search this week. This past Monday, the U.S. turned to its dirt-dwelling psychic, the groundhog, to determine if it was finally time to put our snow boots back in the closet. Searches for “Did the groundhog see his shadow?” hit 100,000+ while other questions like “What is a groundhog?” also peaked on February 2. So did little Punxsutawney Phil see his shadow and curse us with another six weeks of winter? In fact, he did. Can we get a do-over? Now that the dust has settled from this past Sunday’s Super Bowl, there are several things we can take away from the game. First, Tom Brady might be the best quarterback in football history after winning his fourth championship—he was also the most searched Superbowl quarterback. Second, either Seahawks head coach Pete Carroll made the worst call ever or New England’s victory is all part of a conspiracy (you decide). Last but not least, Left Shark put on the best half-time performance of all time… with help from Katy Perry. The Internet fell hook, line and sinker for the choreographically inept shark. Searchers were also curious about Missy Elliot after her appearance in the show. Model Ashley Graham also made a splash this week. Don’t know her? You will soon enough. Graham is set to appear Sport Illustrated’s famous swimsuit issue, making her the first plus-size model to be featured in an ad in the magazine. The spotlight is back on Lance Armstrong and it’s not helping the cyclist’s already damaged reputation. Back in December, Armstrong and his girlfriend Anna Hansen were involved in a hit-and-run accident involving parked cars. At the time, Hansen said she was driving the car during the incident—but it turns out Armstrong was actually the one behind the wheel, leading to two misdemeanor charges, rising interest on trends and more embarrassment for the star. Iconic and reclusive writer Harper Lee topped the search charts when news emerged that she will be releasing a new book, a sequel to To Kill A Mockingbird, in July. The book comes 55 years after Lee’s first novel and the writer has a long history of avoiding the spotlight: She hasn’t granted any interviews or public appearances since Mockingbird came out. While many fans are rejoicing, the surprising announcement is leaving others skeptical. Lee turns 89 this April and is reportedly in ill health, leading some people to feel that the author might be being taken advantage of. We’ll have to wait and see how this story—as well as the one in Go Set A Watchman—unfolds. Ready for the long Presidents Day weekend? Look up flights for a last-minute escape. Just say, “Ok Google, show me flights from San Francisco,” to find where you can go to enjoy the day off. This entry was posted on Friday, February 6, 2015 at 3:10 PM and is filed under Search, search trends. You can follow any responses to this entry through the RSS 2.0. You can leave a response.